For already half a decade Hublot and Ferrari have joined forces in creating some of the industries most innovative watches. Thanks to the fruitful collaboration these watches are as much Ferrari as they are Hublot. This is especially true for the new Big Bang Ferrari that Hublot revealed yesterday at Museo Enzo Ferrari in Modena. The new Hublot Big Bang Ferrari comes in three different varieties: titanium, King gold and carbon fiber. Although the design is identical for all three watches, the different materials make them look almost like completely different watches. Limited to 1.000 pieces the titanium Big Bang Ferrari shows off the new design in a grand way! The case on the new Big Bang Ferrari is more fluid, in particular on the right side where it curves over the crown. This leaves room at the side of the case to incorporate the iconic groove that you can also find on the rear of the LaFerrari. Another nice feature is the Ferrari name incorporated on the other side of the watch in a sandwich-like construction. The new dial design is extremely legible, thanks also to the redesigned hands, but credit also goes to the subdial minute counter and date window at 3 o’clock which are designed in the same style as Ferrari’s famed tachometer. The King Gold Big Bang Ferrari is perhaps the most expressive of the three new watches. Limited to 500 pieces, Hublot gave it a rather technical look by applying a brushed finish to the 45mm gold case. It gives the watch a very distinct look and creates harmony with the rest of the features. The Ferrari logo is discretely placed at six o’clock, opposite of the Hublot logo above it. Like the other watches in the collection is also the King Gold fitted with a strap made from Alcantara, rubber and red stitching reminiscent of the interior of a Ferrari. The Big Bang Ferrari in carbon, limited to 500 pieces, stands a bit apart from the other two new models. This thanks to the use of red for the hands, numerals and hour markers. This creates quite a bit of contrast with the carbon fiber case, making it easy to read the time. The unidirectional carbon fiber that Hublot used to craft the case and bezel of this model give the watch a sense of mystique. It makes it look like the body of a Ferrari before it is painted in the color preferred by the customer. As the heart of the Big Bang Ferrari, we find of course Hublot’s Unico Flyback chronograph movement. This high-performance movement draws some similarities with Ferrari’s V8 and V12 engines regarding construction and use of exotic materials. The Unico movement is fitted with a pallet fork and escapement wheel crafted from Silicon. The double clutch and column wheel are placed on the dial side of the movement so that they can be admired much in the same way as you can admire the engine in some Ferrari through the transparent engine bay. The oscillating weight of the movement is shaped like a Ferrari’s most famous rim design, with its iconic five spokes. The new Hublot Big Bang Ferrari once more proves how closely related the DNA of both companies are, and the synergy that they can accomplish when working together. 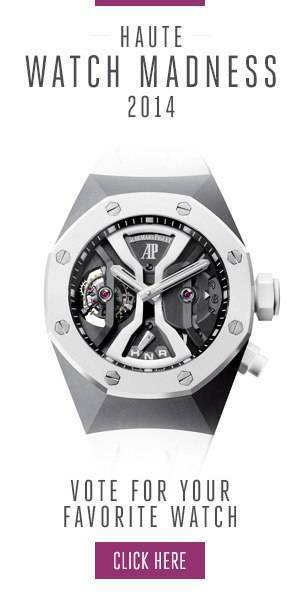 It is yet another example of the “Art of Fusion”, merging this DNA together into yet another great, new watch design.